Tom Wolfe's I AM CHARLOTTE SIMMONS (Picador) is a major disappointment. 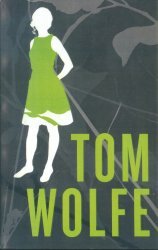 Although I've always considered Wolfe a better journalist than novelist (for proof, compare The Electric Kool-Aid Acid Test to the present volume), but at least in books like The Bonfire of the Vanities he took on contemporary, important issues, such as race and class in late 20th-century USA. In CHARLOTTE, though, he goes where countless other writers before him have gone, to the familiar, well-trampled groves of acadamene. With a heroine who is a feckless freshman at snooty Dupont University, Wolfe has a tough time engaging the adult reader in all but a superficial way. True, Charlotte does learn some hard truths about Dupont--that it exploits black athletes for entertainment and amusement, that its politics are corrupt and despicable--but on the whole most of her observations are on the banal side: students drink and party too much, their rooms and underwear are filthy, and so on. Wolfe seems to be treading water with this fitfully funny, raunchy, cliche-ridden novel. Perhaps he's just dog-paddling around in the literary waters while searching for bigger and better fish to harpoon.